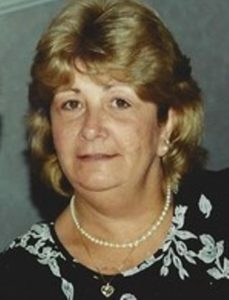 Shrewsbury – Sheila Ann (Jones) Tambolleo, of Shrewsbury, passed away unexpectedly after a brief illness Aug. 2, 2018 at UMass Memorial Hospital at the age of 67. She was the wife of the late John J. Tambolleo. Born in Milford, the daughter of the late Robert W. and Rita (Flanagan) Jones. Sheila was raised in Uxbridge, and graduated from Uxbridge High School in 1969. Sheila loved helping those in need, and for most of her career she worked as a caregiver. In her free time, she enjoyed being by the pool with family, making jewelry and painting ceramics, baking and shopping. She also enjoyed spending time searching for treasures at yard sales. Most of all, she cherished time spent with family, and winters in Florida. She is survived by Steven Tambolleo and his companion Paula Dewar of Groton, Cynthia Martelli and her husband Dennis of Northborough, Kenneth Tambolleo and his wife Barbara of Worcester, and Gary Tambolleo and his wife Peggy of Worcester, and many nieces, nephews, grandchildren, great-grandchildren, and close friends Pat and Joy. She was predeceased by her siblings, Mary Andrews and Robert W. Jones II, and a nephew, Luke Andrews. Relatives and friends are invited to attend visitation hours Wednesday, Aug. 8, from 4-7 p.m., at Britton-Shrewsbury Funeral Home, 648 Main St., Shrewsbury. A funeral Mass will be celebrated Thursday, Aug. 9, at 10 a.m., in Saint Mary’s Church, 640 Main St., Shrewsbury. In lieu of flowers, donations may be made in her memory to Scleroderma Foundation, Matching Gifts, 300 Rosewood Dr., Suite 105, Danvers, MA 01923.